History of Euro - the Euro currency was launched or introduced as an accounting currency on January 1, 1999. The history of Euro started with the acceptance of the Maastricht Treaty. The history of Euro begun with participating countries fixing their domestic currencies to the Euro. This event in the history of Euro meant that local currencies were not allowed to fluctuate against the Euro and against each other. When the history of Euro was started, Euro was launched merely as an electronic currency. Euro as a cash currency did not become a legal tender until later, on January 1, 2002. The German Mark, French Franc, Italian Lira, and other local currencies ceased to exist on July 1, 2002. This date was important not only as the history of Euro in its cash form, but this date was also important in the history of Euro as the beginning of centralized monetary policy. With the introduction of Euro, the European Central Bank started implementing monetary policy of the countries which were using the common currency. When looking at the history of Euro, we can see that attempts to create a single currency go back some 20 years. The chart below shows the value of the Euro against the US dollar. Before 1999, history of Euro is shown as a basket of the 11 legacy currencies. The roots of the euro currency originated in the European Monetary System in 1979 which involved creation of the European Currency Unit. Per history of Euro, originally twelve (12) of the 15 EU countries (Germany, France, Austria, Spain, Portugal, Italy, Belgium, Luxembourg, the Netherlands, Finland, Greece and Ireland) were members of the so-called Eurozone. Euro history tells us that these states were joined later by Slovenia (2007), Cyprus (2008), Malta (2008), and Slovakia (2009). The history of Euro is that on January 1, 2002 the Euro replaces the old national currencies. We can see in the history of Euro chart above that European currencies have always fluctuated against the dollar, even as debates have raged about the Euro. The Euro became the single currency of 12 European states in 2002. Other states joined the currency later. The Euro was implemented with the goal of creating a more stable European economy. Looking at the history of euro, we can see that the Euro improved economic growth across Europe and offered more integration among financial markets. The euro history also shows that the Euro currency strengthened European presence in the global economy through being a reserve currency. The history of euro also proves that the Euro helped ease exchange rate volatility among different European nations. The history of euro has brought also a number of problems. While the euro improved stability of the region, all nations have to have relatively similar interest rate to avoid interest rate arbitrage. This has created problems for some economies in the euro history, such as Germany. The Euro has taken away the interest rate as a tool of the fiscal policy. If the local economy slows, the local government cannot lower interest rates to stimulate growth. The next picture shows the modern history of Euro. The history of euro timeline shows a number of important euro history events. The history has started in 1999 with the Euro adoption. 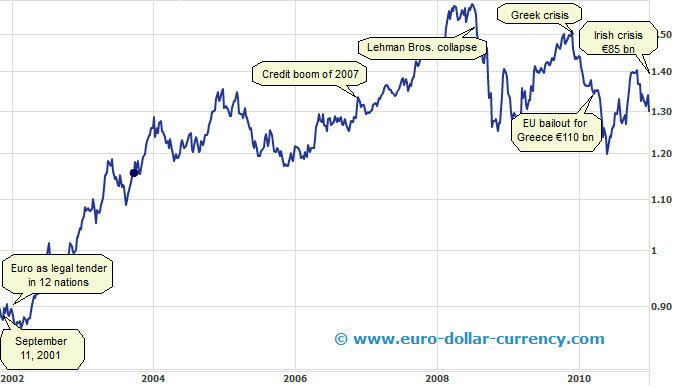 The Greek and Irish crises in 2010 were very important events in the history of euro. Basic fact: The History of Euro tells us that the Euro became the single currency of the twelve European states in the year 2002.